The Underground Car Park is located in the heart of the University of Melbourne's Parkville campus. 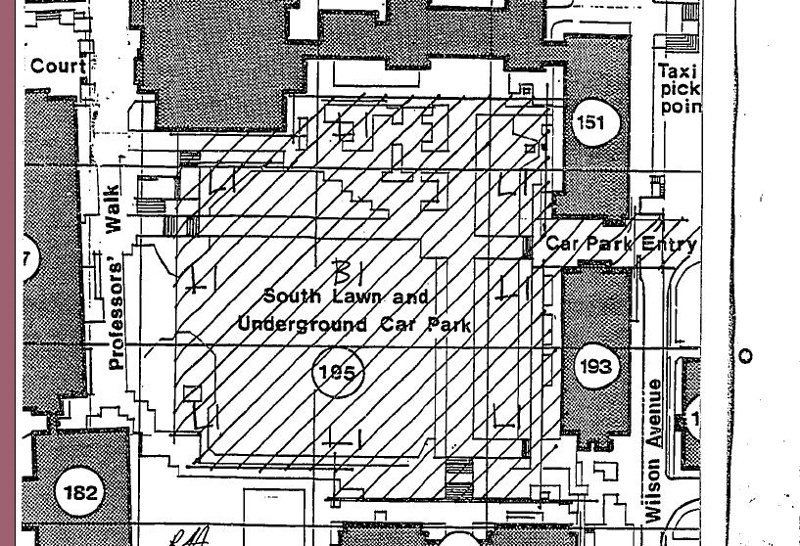 The car park had been provided for in the Campus Master Plan which was prepared by Bryce Mortlock in 1970. The scheme provided a solution to the problem of too many cars on the campus whilst simultaneously providing a landscaped area above. It was designed by the architectural firm Loder and Bayly in association with Harris, Lange and Partners. The engineer in charge of the project was JL van der Molen. Excavations commenced in May 1971 and the car park was completed by November 1972. Landscaping of the South Lawn area above the car park and areas adjacent to the Baillieu Library and John Medley Building were carried out by the firm of Stones and Rayment. The Underground Car Park is constructed of reinforced concrete shells with parabolic profiles supported on short columns. The columns contain drainage pipes which allowed for the planting of the lawn and trees of the South Lawn. 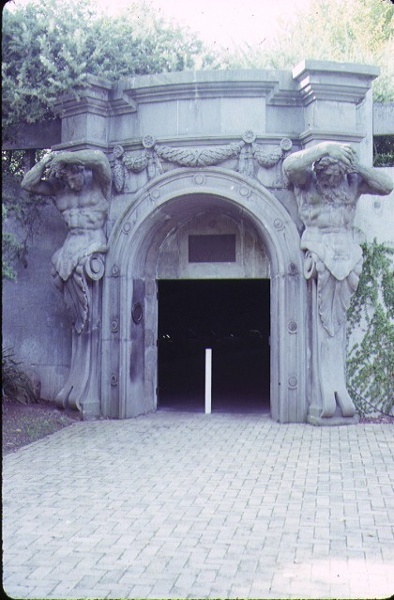 The east entrance contains a door from a 1745 house in St Stephen's Green, Dublin whilst the west entrance is framed by two Atlas figures from the demolished Colonial Bank, Elizabeth Street. 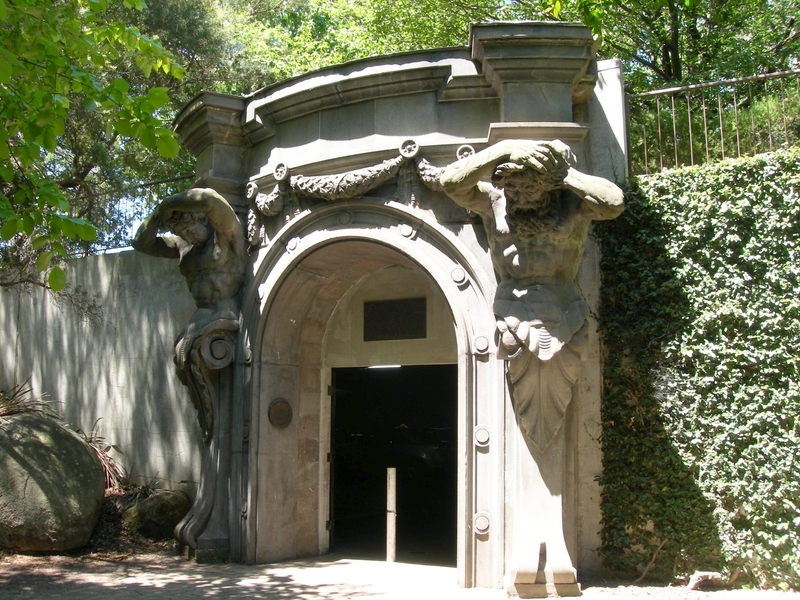 The Underground Car Park is of architectural significance to the State of Victoria. The Underground Car Park is architecturally significant as an extraordinary example of a building type. At the time of its construction no other car park in Australia was fully enclosed and concealed underneath landscape. The vaulted form of the car park interior creates a dramatic and evocative space. The design demonstrates an innovative and imaginative solution to the mundane and utilitarian problem of car parking. Additionally it is significant as an unusual form of reinforced concrete, but demonstrates the versatility of the material and the architectural expression that it can achieve. The car park's appearance on ABC television as setting for a ballet sequence and its use in the internationally successful film Mad Max is indicative of the car park's wide aesthetic impact on public consciousness. The arched entrance flanked by the Atlas figures and the addition of a 1745 door from Saint Stephens Green, Dublin represents a notable application of decorative schemes and material in construction and design. Under section 14 of the Historic Buildings Act 1981 the Governor in Council amends theRegister by adding Historic Building No. 1004. Underground Car Park, South Lawn, University of Melbourne, Parkville, City of Melbourne.